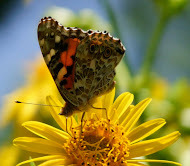 For any pollinator that stops by for a late summer or early fall nosh of pollen or nectar. Crab spiders are busy hunting all season, but they are especially noticeable on the nectar and pollen rich fall flowers. Clever little critter~that's exactly where all the pollinator action is from now until frost. They are generally passive ambush hunters, waiting patiently for an unsuspecting bee or fly to land near their hiding spot. They are quick and like crabs can move backwards, forwards and sideways with ease. Masters of camouflage, they can change colors to match the flower they are hiding on. No pollinator could distinguish this carefully constructed hiding place on Rudbeckia triloba from petals fluttering in the wind. So, my darling bees and my precious butterflies you must be careful out there! There is no way to tell if there is a treat or a trap on any flower you land upon. There is danger lurking everywhere and even though I know it's all part of the circle of life, I wish you safe and happy nectaring. Well written and illustrated, Gail. I've never thought much about these guys, and now you've got me thinkin'! They certainly are masters of disguise--I hope, too, the butterflies and bees are very cautious when they are feasting away! I like spiders. On flowers rather than my arm but still, they are interesting creatures. What will they eat if not the unsuspecting critter? I think they should eat ants. I am not that fond of ants. Nice post and one which made me think of the cycle of life...and death in the garden. Good finds! Sometimes they are so well hidden! Great post - and wonderful photos! I especially like the second one, with the spider's legs interspersed with the Echinacea petals! Great pictures! I've been startled more than once by spiders hiding in my flowers. They're good at camouflage. I wish they didn't eat the good bugs. Gail, I am admiring your powers of observation! I would love a macro!! Great photos--I'm seeing a lot of the crab spiders too. That's a beautiful butterfly. Great macros. Dear Gail, I loved reading your words of warning and viewing the peekaboo spiders! I adore the little crab spiders and thought they just happened to match the flowers, did not realize they could change colors. Layanee has the perfect idea, spiders that eat ants! I don't like ants, either. Fascinating little spiders, aren't they? They seem to like my Trilliums in the spring, too. Great shots, Gail! Thank you...I've not seen them on trilliums, but, I'll look now! Very beautiful shots as usual. I haven't seen spiders like those, and bees with white hirsute bodies like that! Wonderful photos of unusual creatures. I'm going to have to look more closely. 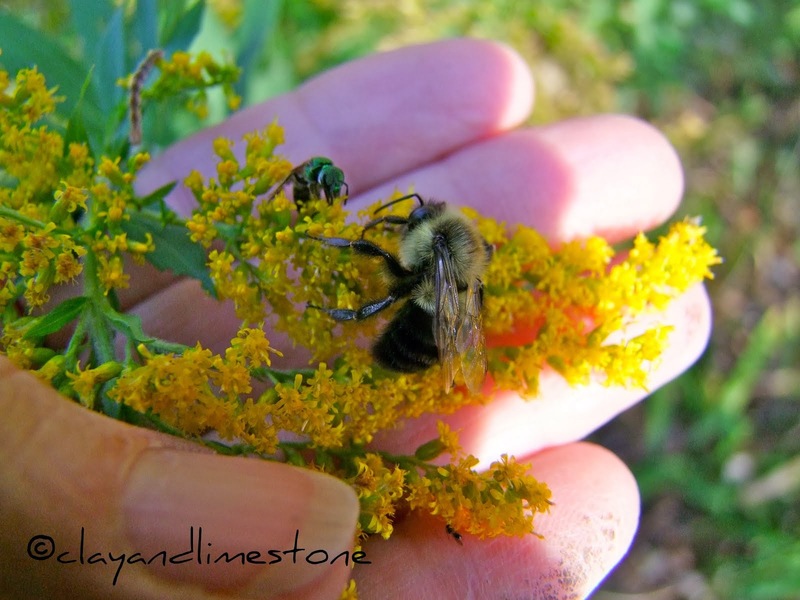 I can say we have lots and lots of pollinators this year, and lots of goldenrod for them to feed on. We seemed to have an absurd number of crab spiders in the garden this year. They usually caught me eye because of the honey bees, or butterflies, in their grasp. I'm always amazed at the size of prey they are able to capture! It's also interesting to see how well they can adjust their camouflage to blend in with the flowers too! Hi Gail, Dang those spiders. I hate to see them capture the sweet bees and butterflies. There must be a reason God made them but it eludes me. :) Great post. I know you hate them! The spiders are food for birds. It's a fascinating world, isn't it. Love the info on the crab spiders and the great pictures of them. Wow, look at all those crab spiders! I don't see them often, but now, I'm wondering if that's because they are blending in so well. Yes, we have a number of critters that are involved with each other in different ways. I love having the butterflies and caterpillars, but the wasps that eat the caterpillars are also drawn in, and there are a number of birds that also enjoy nibbling on them. Crab spiders are just too cool and I really enjoy finding them...of course the pollinators are not overjoyed...I love them when they turn white with pink stripes. Hmmm, I'll have to keep my eyes open for these sneaky little guys. I put up a similiar post yesterday, as I found a praying mantis lying in wait on my sedum Autumn Joy! They can munch all they want, but I sure hope they don't eat my butterflies!